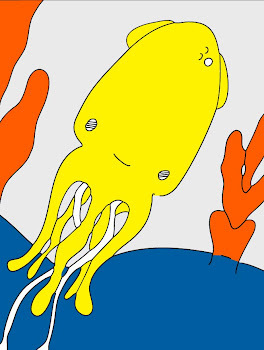 Technicolor Squid: Our Car Done Broke. Oh hello Lovelies! Have I mentioned lately that you are ALL on my mind? Well, you are! It is nice to have you on my mind because otherwise I would have to think about our transmission pump problem that is affecting the carburetor, the rear bumper and umm ... the glove compartment!! (?) Those are all car words right? Yes, well I am sure that they are all some how affected by whatever done broke on our car! Now Charlie is constantly barking his big scary dog bark that gets on my nerves, because He is off getting a rental car and left the dogger at home with me! Fun!! This absolutely beautiful card is from the beautiful Miss Dawbis. It arrived today and absolutely made my heart sing! Isn't it incredibly perfect in every way? I agree, it is!! Thank you miss. You made a downhill day pick up and fly off into the clouds, where I now sit upon #9. There is a small similarity to a card that I am working on for her which I will show you later, however this card is a million times better! A million times better!! In other news Etsy is still down, so I will share a tiny amount of goodies with you tomorrow and put them up for sale. It has been a loooong time since I have had anything available at Etsy. Also, a few more Shy Monster Sets will be on their way to Mahar DryGoods very soon! Yay! Did I mention that I am thinking of you? Oh I did? Good! Hugs! xox=vv. Well now I'm definitely thinking about you and wishing your car troubles fly out the car window soon. Sending good thoughts your way! Thinking of you too... and your sickly car. Oh no! Car problems are the worst! I hope everything turns out well soon. I'm glad the postcard arrived just in time to make you smile. I'm sure your postcard is a MILLION BILLION times better, so shh! :) Hehe.